Astroid v0.9.1 has been released! Astroid is a lightweight and fast graphical threads-with-tags e-mail client for notmuch. Written in C++ using GTK+, WebKit and gmime. once you get Astroid running press ‘?’ to get a list of keybindings for the current context. Check out ‘The Tour’ for more details. Astroid v0.8 is now ready! once you get Astroid running press ‘?’ to get a list of keybindings for the current context. Astroid v0.7 is now ready! Astroid (https://github.com/astroidmail/astroid) v0.6 is now ready! Astroid is a lightweight and fast graphical threads-with-tags mail user agent for notmuch. Written in C++ using GTK+, WebKit and gmime. Use any editor (general XEmbed support in edit-message window): Emacs works. Plugins: Python and Lua plugins can now be made, parts of ThreadIndex and ThreadView are exposed allowing extesion of the user interface and advanced customization. Check out the plugins available at GitHub. Crypto: GPG encryption and signing is added. Decryption and and signature status is shown in greater detail. Synchronize maildir flags if so configured in .notmuch-config. Signatures: Include per-account signatures (either included or attached). Saved searches: Save a search with ‘C-S’, then browse saved searches and stats with ‘C-f’. You can also browse search history using Up and Down in the search-bar. Colorful tags: Tag background color is calculated based on MD5 sum and normalized to within a configurable range. The same tag will therefore always have the same color. Thread-index: load all threads in the background. All actions requiring write-access run in the background and wait for any reads to finish. All read operations need to wait for any ongoing write-operations to finish. All write-operations are therefore asynchronous and non-blocking. Read-operations will only block on long write operations. Tags can be modified on multiple marked threads with + and -. Modify tags on single message, they are updated in thread-view and thread-index. Keybindings modified to be more common #171.
scss: fix #82: make all variables global. C-d / C-u / Page in thread-index: Page and move cursor in thread index. Special keys like Tab and Home can now be used in user-keybindings. M. Dietrich: clock_format=year option to use clock format from this or previous year setting in thread-index. M. Dietrich, G. Hope: Background color in thread-index configurable. M. Dietrich: Use correct reply-to address for mailinglist-messages. #103: Drafts are saved on force close or quit by default. C-v: duplicate and refine query. Mark thread moves to next by default. ti: set cursor to first thread if we are at first thread when new addition is made. build: –disable-libsass: do not depend on libsass, but use a sass compiler at build time (-scss-compiler=sassc). Quote lines for reply and forward are formatted with Glib::DateTime::format(). Astroid v0.5 is now ready! Astroid is a graphical threads-with-tags mail user agent for notmuch. Written in C++ using GTK+, WebKit and gmime. This release includes a lot of changes and improvements from several authors, including increased customizability and many new features. See below for more details and observe debug output for changed configuration options. C-f: Toggle flat or indented view of messages. C-i: Show remote images (cid-type images are not supported yet). A-#: Page to # page. C-j / C-k: Jump and scroll to next or previous element. thread-index: C-Enter: open thread in new window. Add popup menu with some actions for the thread-index. Fix #23: Don’t crash when message file is missing. Fix #25: Load html and scss from config/ui directory if present. Fix #25: Allow some parameters of the thread_index cells to be configured. Move ‘expand all’ in thread view to C-e.
Save drafts with ‘s’, discard them with ‘D’, edit them with ‘E’ from thread index or thread view. Edit messages as new with ‘E’. Show name of pre-defined searches in tab. Tab: jump to next unread thread. Allow messages to be sent as attachments. Hugo Roy: Fix licences to be correct for borrowed stuff. Franz Fellner: Fix some long standing annoying bugs. Use ‘,’ as separator for ‘for_tags’ in config, not ‘;’. Hugo Roy: Refurbished thread-view theme and move to scss processing, your custom thread-view.css needs some attention. Franz Fellner: Clean-up coding style and name-space pollution. Hugo Roy: Made a tour of setting up astroid in the wiki. Print message with C-P and print marked messages with t+p. Run-hooks: Run user-defined shell hooks on keypress using keybinding configuration. Franz Fellner: Integrate with notmuch config, read available options from there. You might have to update some of the affected configuration options. Thread index: only use bold face on authors of unread messages. q: ask to quit, Q: quit right away. 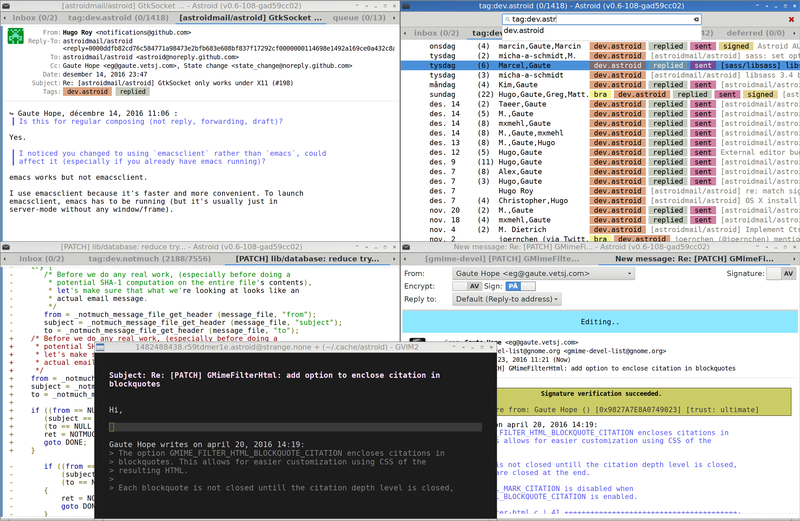 Astroid is a graphical threads-with-tags mail user agent based on sup and notmuch. Written in C++ using GTK+, WebKit and gmime. Astroid is intended to be fast, simple and navigable by keyboard alone (mouse support is not really implemented yet). It can show images as well as HTML parts inline (disabled by default). The mail composer is using an embedded gvim to edit messages (extending to use another editor that supports XEmbed is not difficult). Astroid is tab-based with searches, emails, and composers organized in tabs. 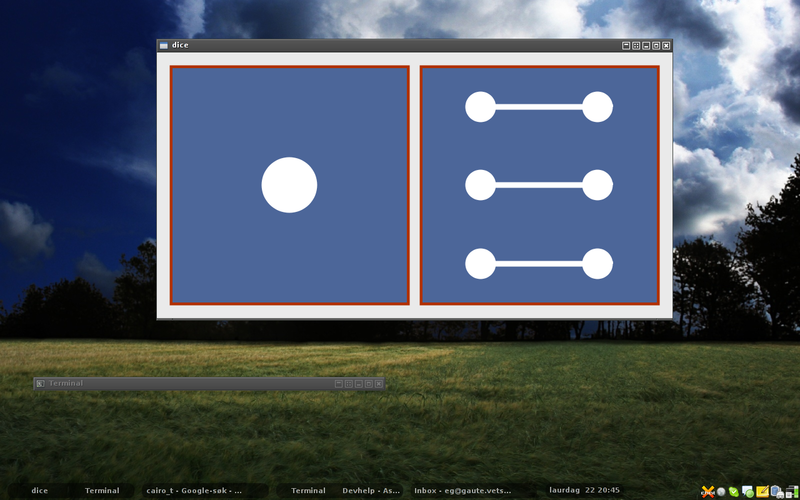 A new main window in the same instance can be opened allowing for several modes or tabs to be visible at the same time. Mark threads with ‘t’ or ‘T’ and apply actions to all marked threads with ‘+’. Mark messages with ‘t’ or ‘T’ in thread-view and apply actions to all marked messages with ‘+’. Show attached icon in thread-view. #18: Fix display of & and friends. Configurable quote string for replying and forwarding. Replying adds ‘replied’ tag to original. Forwarding adds ‘passed’ tag to original. Message is updated thread-index after being sent. Show spinner in main window when polling. Show status icon for message sending. Indent messages according to reply-level in thread (configurable). once you get astroid running press ‘?’ to get a list of keybindings for the current mode. IBCAO_py: A python class which sets up the IBCAO (projection and loads file) for use with Matplotlib. check out the test cases in tests/ for some inspiration on how to use the class. Jakobsson, M., L. A. Mayer, B. Coakley, J. A. Dowdeswell, S. Forbes, B. Fridman, H. Hodnesdal, R. Noormets, R. Pedersen, M. Rebesco, H.-W. Schenke, Y. Zarayskaya A, D. Accettella, A. Armstrong, R. M. Anderson, P. Bienhoff, A. Camerlenghi, I. Church, M. Edwards, J. V. Gardner, J. K. Hall, B. Hell, O. 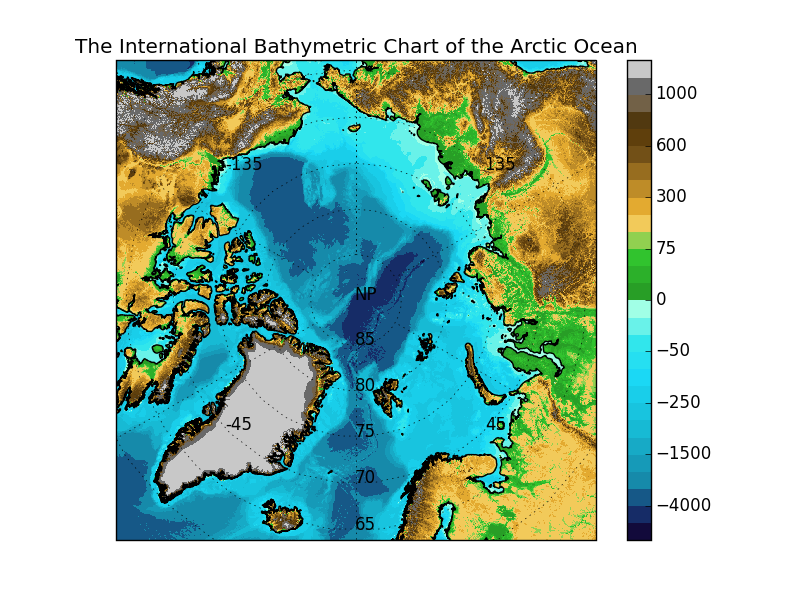 B. Hestvik, Y. Kristoffersen, C. Marcussen, R. Mohammad, D. Mosher, S. V. Nghiem, M. T. Pedrosa, P. G. Travaglini, and P. Weatherall, The International Bathymetric Chart of the Arctic Ocean (IBCAO) Version 3.0, Geophysical Research Letters, doi: 10.1029/2012GL052219. Poll script only updates changed threads (if notmuch_get_rev.. is available). It is still highly experimental software and, in particular, HTML parts from untrusted senders should not necessarily be viewed. 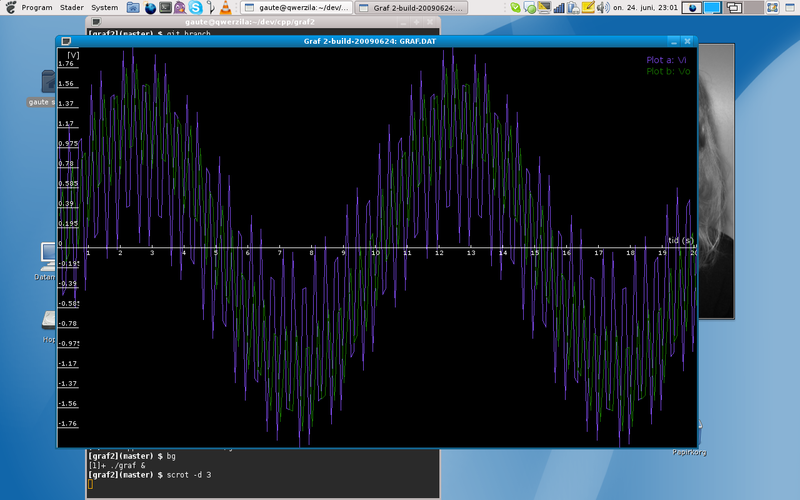 Allow math to be rendered with MathJax! Enclose math with $ or $$, by default we are using MathJax online, but you can set this to your local installation as well. MathJax is enabled by default, and can also be enabled only for certain tags. Highlight code syntax between ``` markdown-style tags as well as patches sent as email. Partial mailto: support, check out –help. Double-click in thread index to open thread. Paging in thread index moves cursor. Do not load remote images or resources from html files. C-m: adds ‘muted’ tag, ‘muted’ messages are excluded from non-explicit searches. Tab: Grabs the first match in tag and search completion. As well as bunch of smaller improvements and bug-fixes.. Either through github or email (mailinglist: astroidmail@googlegroups.com), or here (notmuch@notmuchmail.org, but I do not wish to spam the general notmuchers). Astroid is distributed under the GPL v3 license in the hope that it may be useful, but with no warranty whatsoever. New release of Gnome Schedule 2.2.2. Download from Sourceforge. This release contains updated translations complete log. Sup 0.15.0 has been released. It can be downloaded from rubygems. This release includes the long-in-development maildir syncback support as well as an important security fix. If you are upgrading from before 0.14 please check these migration steps. More information in the release notes and history. Thanks to all the contributors. See full log. Report issues to the GitHub tracker. several others have been contributing. it to current sup, maintained it and gotten it ready for release. the more daring features to make sure sup is stable-ish. disabled) and per-source (default: enabled). filename (default filename is used). please read the migration instructions in the wiki . Please report any issues you encounter to our GitHub issue tracker . Sup 0.14.0 has been released. It can be downloaded from rubygems. This release includes a bunch of fixes and updates, it drops ruby 1.8 support, and includes CJK support for the index. UTF-8 support is strengthened and sup is more thread safe. Some migration steps are required from Sup 0.13.0. See the release notes and history. Sup 0.13.0 has been released. It can be downloaded from rubygems. This is release will be the first in the 0.13-line which most likely only will receive bugfixes. Further development will be for 0.14 with ruby 2.0.0 support and should include some major changes. The release contains bugfixes which have accumlated for a long time. See full log. New release of Gnome Schedule 2.2.1. Download from Sourceforge. This release contains updated translations and bug fixes complete log (previous release 2.2.0). New release of Gnome Schedule 2.2.0. This release contains updated translations, bug fixes and FreeBSD support. Check out the complete log (previous release 2.1.5). -----BEGIN PGP SIGNED MESSAGE----- Hash: SHA1 I have revoked my old key, 79E6AAA6, and replaced it with the new 4096 bit RSA key A0749023. staritems.py: A python script used to migrate starred and liked items to a new Google Reader account. With the required migration of account data and Google Reader data; subscriptions could be exported and imported, but starred and liked items could not. However, they could be exported as JSON. This script reads the JSON data and adds stars and likes to the items again. 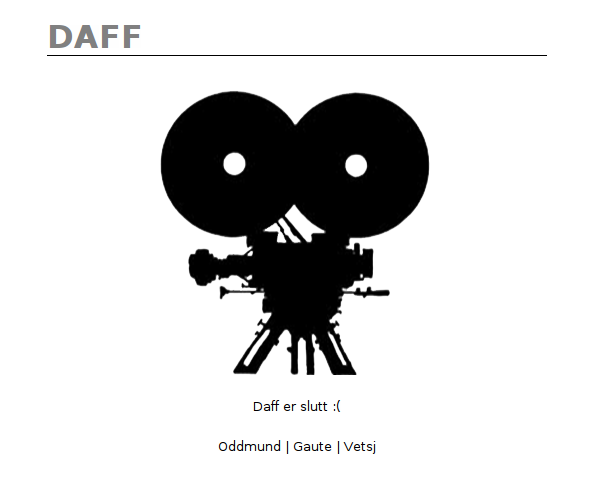 There is a very basic implementaion as a web app here: greader (google reader has been discontinued). New release of Gnome Schedule 2.1.5. This is a quick update from 2.1.4 adding new translations. Here the complete log. New release of Gnome Schedule 2.1.4. This release has scripts for exporting and importing tasks and disables the GNOME panel applet by default since this is not supported in GNOME 3. It can be enabled by the –enable-applet option. Also included are updated translations. See the complete log for differences since RELEASE-2-1-3. New minor release of Gnome Schedule 2.1.3. This contains updated translations - and a configure script that tries to avoid Python 3 (since PyGtk does not support it), complete log, untill RELEASE-2-1-2. Features lots of translation updates and some bugfixes; complete log, untill RELEASE-2-1-1. src/examples/surerun.sh - Example solution to making sure a task is run each day. See this thread. "getphotos":http://github.com/gauteh/getphotos is a small C++ program that attempts to read and extract photos from an iPod Photo database. It was used on an 120GB iPod Video to extract the 720x480 "YUV 4:2:0":http://en.wikipedia.org/wiki/YUV#Y.27UV420p_.28and_Y.27V12.29 sources, and an included matlab "script":http://github.com/gauteh/getphotos/blob/master/matlab/yuvtorgb.m by Åsmund Kjørstad interpolates the U and V layers and outputs BMP's. There is an "attempt at implementing the converting in C++":http://github.com/gauteh/getphotos/blob/master/yuv420.h , but it's still lacking a functional "YCbCr":http://en.wikipedia.org/wiki/YCbCr conversion. Y, U and V layers are extracted properly though. You specify the path to the Photos folder of your iPod - so copy it somewhere and use that as the input. The database reading is mostly based on "iPodLinux wiki (ITunesDB/Photo_Database). ":http://www.ipodlinux.org/wiki/ITunesDB/Photo_Database "README":http://github.com/gauteh/getphotos/blob/master/README "Source (github)":http://github.com/gauteh/getphotos/ You need Scons to build (or just do g++ getphotos.cpp), and "Matlab":http://en.wikipedia.org/wiki/Matlab to use the convert script. Graf2 plots coordinates and draws a line between them. It’s written in C++ and SDL. I have gotten alot of different bug reports and problems sent to me when people try to use gnome-schedule, and quite a few of them are actually crontab and atd problems; mostly just them not being there at all. This post tries to give you an idea about how you can figure out what is wrong; or how it is supposed to work. Exactly how to set up crontab and at differs for all distributions and they all have their own tutorials. If something works; don’t fix it! No guarantees! - this could possibly break everything. 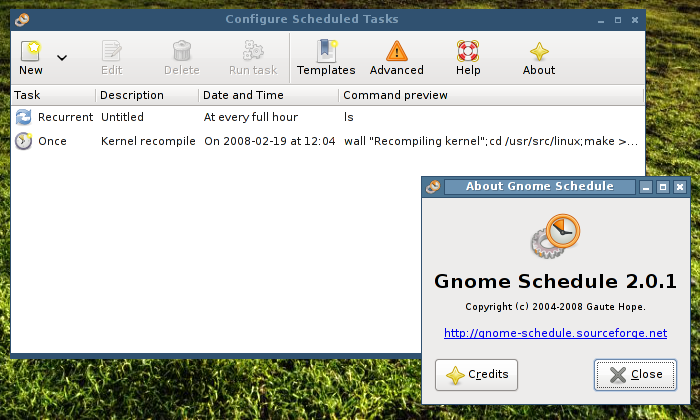 Gnome-schedule is a front-end to crontab and atd, and it is those that actually run the tasks. They have both been around since the beginning of time and were made for the command line, and don’t have any graphical interface. Crontab is responsible for recurring tasks, scheduled for instance for ‘Every minute’ or ‘Every hour’.. but also quite complex expressions like every second minute of every fifth hour every 13th day of the month, but only if its wednesday. Atd schedules one-time tasks like ‘tomorrow’ or 24th of December. First you need to have crontab installed (there are several; vixie-cron and dcron works well) use your package manager for this. After having installed it you have to tell your system that the cron daemon should be started at system start, check with your distro on how to do this. This should give you a line ending with something similar to: ‘/usr/sbin/crond’. If not; crontab is not running and you should make sure it is set up like your distro told you. The cron.allow and cron.deny files: According to the Ubuntu wiki your user must be in /etc/cron.allow (if it exists) or not in /etc/cron.deny (if it exists). If neither exist, depending on implementation or distribution, only root can use crontab - this is not the case for Ubuntu or Arch Linux. See this crunchbang tutorial for details on what this does. .. wait a minute .. Install at and set it up, refer to you distributions documentation. As with crontab; this should give you a line ending with ‘/usr/sbin/atd’. If not; at is not running, make sure it is installed and refer to your distro for starting the atd service. If not; at is not installed, refer to your distro for installing it through the package manager. $ at 22:00 19.02.2009 # replace the date with something in the very near future You know get a at prompt: at> echo "I work" > ~/at_test at> <Ctrl>+D To list current jobs try: $ atq If a job shows up now it worked. Wait for the scheduled time to pass and check the contents of at_test in your home dir; if it is there it worked. Make sure that you are not listed in /etc/at.deny and that if you have something like an /etc/at.allow file, you are listed. Refer to the at man page. 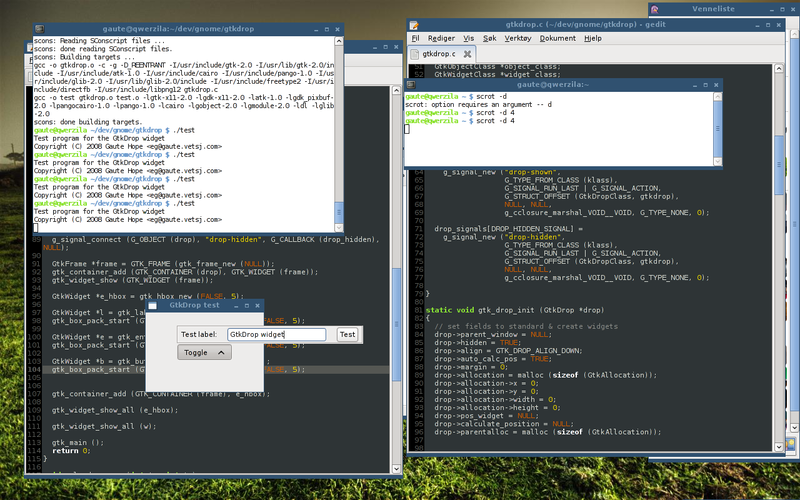 I created a small GTK+ widget based on GtkWindow which I called GtkDrop. I once wanted to create a popup calendar for gnome-schedule and this is basically that code put into a widget (and ported to C). It is intended to be a ‘popup’/’dropdown’ container where you can add any widget and it will behave similar to menus or comboboxes. And you will be able to use the widget inside it, ie: write in a GtkEntry or press a GtkButton. In case you want to try it out download it, the test program is included.